City leaders face a daunting task when trying to convince residents to take a particular action — say, sign up for a doctor’s appointment or move online for services they’re used to receiving in person. But recently, a growing number of these leaders — including those in Denver, New Orleans, and San José, Calif. — have started taking cues from psychology to better understand why people make certain choices and then how to influence them toward behavior that increases city efficiency and helps leaders better meet residents’ needs. In 2010, when former British Prime Minister David Cameron set up the world’s first government unit dedicated to behavioral science — or “nudges,” as they are colloquially known — his aim was fairly straightforward: save money. The unit he created, the Behavioural Insights Team (BIT), was given a clear mandate to save British taxpayers 10 times the unit’s operating cost in just its first year. It seemed a daunting challenge, but BIT ended up saving the treasury 20 times its operating expenses, and is estimated to have saved the national government ₤300 million (more than $386 million) in its first two years. But BIT did more than save taxpayers’ money, it also increased tax income. For example: By better directing online taxpayers to the appropriate forms, it increased response rate by four percentage points. And by including a photo of an automobile in a letter about delinquent vehicle taxes, it increased relicensing rates by nine percentage points. The trend toward governments drawing on psychology to better understand the motivations behind their constituents’ behavior spread slowly in the early 2000s. The notion that human decision-making was less rational and more prone to influence by seemingly irrelevant factors flew in the face of the more common belief that free markets, alone, should guide decision-making. But now the so-called “nudge” is a widely accepted practice around the world. A number of U.S. mayors also are increasingly turning to this practice. Their efforts got a major boost in 2015, when Bloomberg Philanthropies launched What Works Cities. The program is designed to help mayors and other leaders in 100 mid-sized American cities gather data, share it publicly, and use it to make better decisions. What Works Cities is partnering with BIT specifically help local governments communicate better with residents. Leaders in Denver, San José, and New Orleans have used this insight to get pay city taxes online (Denver), stop dumping waste in public spaces (San José), and make a doctor’s appointment (New Orleans). One of the many things Hurricane Katrina upended in 2005 was New Orleans’ city health care system. Charity Hospital, which served the city’s uninsured prior to Katrina, was destroyed by the hurricane. Residents were, instead, directed to use community health centers. But many didn’t get the message — or didn’t make the transition. Ten years after Katrina, the city learned that nearly half of 56,000 residents eligible for free health care in the community clinics were not going on a regular basis. 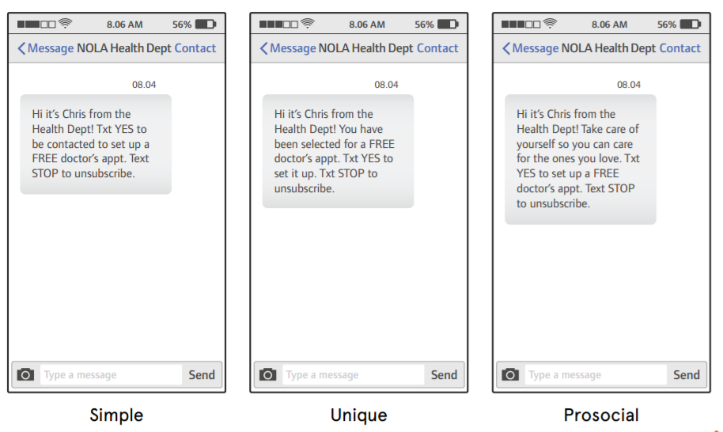 New Orleans experimented with a text messaging service to see how small variations in its messages increased the number of residents who sought care. Eligible residents — 21,000 of them — were randomly assigned to one of three groups, each of which received a different text message. The first message simply stated that the recipient should, “Txt YES to be contacted to set up a FREE doctor’s appt.” The second message read, “You have been selected for a FREE doctor’s appt. Txt YES to set it up.” The third message used what’s known as a “pro-social” strategy by reminding recipients that their choices can positively affect others. It noted that the recipient should, “Take care of yourself so you can care for those you love” before offering the free appointment. Five days after the text messages were sent, OPA analyzed the data — and found some surprising results. 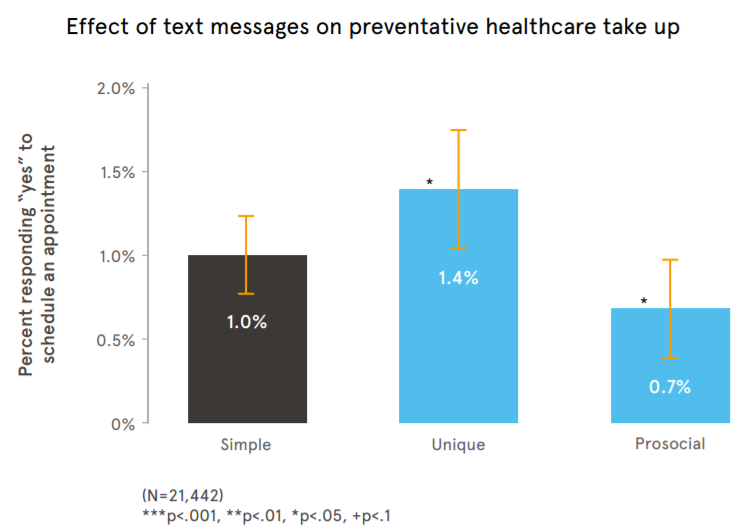 The second text, which emphasized how the recipient had been selected, was the most successful prompt, increasing the number of people scheduling appointments by 40 percent compared to the simple message. The third text, which emphasized the pro-social component, actually led to fewer recipients signing up for an appointment. By testing different motivations for behavior — simply noting the offer of a free appointment, being selected, or being reminded of the obligations to loved ones — the city of New Orleans found that the most and least effective ways to spur the use of a government program differed from what was expected. The team in San José was faced with an expensive citywide problem: Mattresses, couches, washing machines, and other large items were being dumped illegally near creeks, in vacant lots, and left curbside. And the problem was only getting worse. In fact, the increase in dumping not only created property value-sapping blight, it also directly cost the city thousands of dollars in cleanup expenses. That’s when the city’s Environmental Sciences Division (ESD) piloted a program that offered free, large-item pickup and disposal of up to three items. To advertise the new Large Item Collection program, the ESD partnered with their colleagues on the Data Analytics team and at BIT. Together, they designed two different postcards advertising the free large item collection. 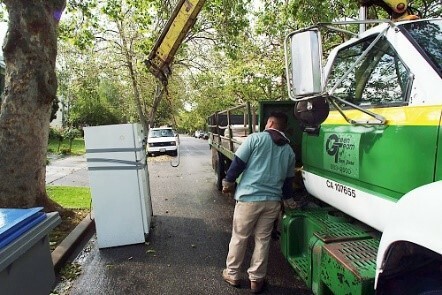 The first postcard, titled “Do It The Right Way,” noted the “The City of San José spends $87 each time someone improperly disposes a large item.” The second postcard, titled “You’ve Been Selected,” simply stated, “You’ve been selected to receive a FREE large item removal.” Both versions had text in English, Spanish, and Vietnamese, which are the most common languagesspoken in the city. The city conducted a three-month study, where the team tracked the number of residents who used the service. The first postcard was sent to 3,280 households, and 3,281 households received the second postcard. A control group of 135,686 households received no direct-mail advertising the program. The first postcard resulted in a 75 percent increase in large item collections compared to the control group. The second postcard doubled that, resulting in a 150 percent increase in households using the service. By testing different ways to appeal to residents, the city of San José not only saved money and reduced blight, but also found a more effective message to encourage residents to take advantage of a needed government service. In Denver, the city created an online system specifically for businesses to electronically file their taxes. The city sent letters to businesses encouraging them to “Go Green!” But the effectiveness of the letters plateaued after the first 18 months, and online registration was stagnant. Working with BIT, city leaders devised a new framework to appeal to local entrepreneurs. Psychological studies have shown that feelings of pain associated with losing are much more potent than the feelings of pleasure associated with winning. This is known as “loss aversion” in behavioral economics, and is associated with analyses of how people make choices. Drawing upon this insight, Denver experimented with how it framed reminders to businesses about the online system. BIT tested two alternatives to the “Go Green!” message. 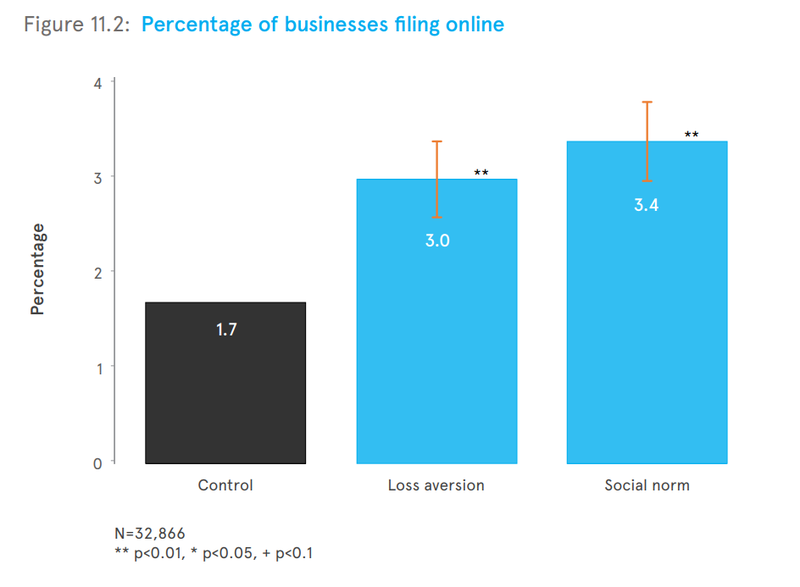 One emphasized the time lost when not filing taxes online, and the other relied on social cues, noting that the business receiving the letter was in the minority of businesses not filing online. Both alternative letters out-performed the original. As these examples show, the spread of behavioral insights into government isn’t only increasingly the norm, it’s proven to be an effective way of communicating with and better serving residents. This article originally appeared in [https://medium.com/@BloombergCities/behavioral-science-is-quietly-revolutionizing-city-governments-74615a0ec2f] and belongs to the creators.